This is a I can't possibly review this review. Sarah Waters can do no wrong in my eyes. She could publish her shopping list and I'd give it five stars. Every book I've read by this author (all of them) pleases me like nothing else. I'm sure her pen, laptop or notebook is really some kind of magic paintbrush that comes pre-installed with genius edition software for which she alone knows the password. I'm invested in all her characters one hundred percent, I feel for them, I want to be their friend, I want to tell them it'll be alright and pass them a smoke and appreciate their taste in attire, without judgement. I can't review this! I feel as though I'm not worthy or wordy enough! 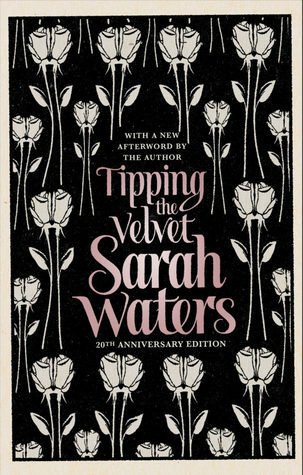 Sign into Goodreads to see if any of your friends have read Tipping the Velvet. 6.0% "Grrr...I want to carry on reading this until I finish it, but alas, I have to get ready to go out and do that annoying socialising thing this evening! 😑"
69.0% "Part 3. THIS IS THE LAST SARAH WATERS BOOK I HAVE LEFT AND I DON'T WANT IT TO END!!! 😭😭😭😭😭"
95.0% "Noooo... I'm heading towards the end! 😭 Never have I tried to make a book last so long!"